Rich, dark ruby ale, with a deep chocolate flavour and a soft smokiness – a truly warming winter pint. This modern porter, brewed on Atlantic Brewery’s Cornish smallholding, is all about the malt. Crystal malt lends sweetness, balanced by the dryness of black malt (which also brings the subtle smokiness). Under it all, the rich flavour and colour of chocolate malt. 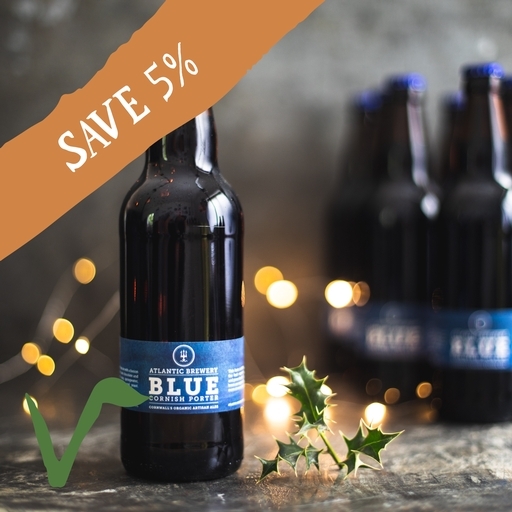 12 Atlantic blue 50cl: Alcohol 4.8%, Suitable for vegans. You’d be hard pushed to find brews with a better view than those at Atlantic Brewery. The old tractor shed on their smallholding (first converted into a microbrewery in 2005) overlooks the sea near Newquay, Cornwall. Atlantic believe in natural ingredients and techniques: their land is Soil Association accredited, so they can grow their own organic hops, and fresh, sweet water is drawn from the brewery’s own natural spring. The best beer comes from the best ingredients – pure and simple. Atlantic blue: Water*, Malted Barley, Malted Wheat, Hops, Raw Cane Sugar, Yeast*.